Incompressible SPH (ISPH) is a promising concept for the pressure computation in SPH. It works with large timesteps and the underlying pressure Poisson equation (PPE) can be solved very efficiently. Still, various aspects of current ISPH formulations can be optimized. This paper discusses issues of the two standard source terms that are typically employed in PPEs, i.e., density invariance (DI) and velocity divergence (VD). We show that the DI source term suffers from significant artificial viscosity, while the VD source term suffers from particle disorder and volume loss. As a conclusion of these findings, we propose a novel source term handling. A first PPE is solved with the VD source term to compute a divergence-free velocity field with minimized artificial viscosity. To address the resulting volume error and particle disorder, a second PPE is solved to improve the sampling quality. The result of the second PPE is used for a particle shift (PS) only. The divergence-free velocity field—computed from the first PPE—is not changed, but only resampled at the updated particle positions. Thus, the proposed source term handling incorporates velocity divergence and particle shift (VD + PS). The proposed VD + PS variant does not only improve the quality of the computed velocity field, but also accelerates the performance of the ISPH pressure computation. This is illustrated for IISPH—a recent ISPH implementation—where a performance gain factor of 1.6 could be achieved. The online version of this article ( https://doi.org/10.1007/s00371-018-1488-8) contains supplementary material, which is available to authorized users. 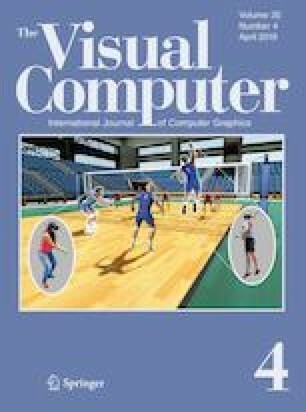 Ihmsen, M., Orthmann, J., Solenthaler, B., Kolb, A., Teschner, M.: SPH fluids in computer graphics. In: Lefebvre, S., Spagnuolo, M. (eds.) Eurographics 2014–State of the Art Reports, pp. 21–42. The Eurographics Association (2014). https://doi.org/10.2312/egst.20141034.